Also known as: 4Kx2K quad screen splitter, HDMI KVM multiviewer, four video sources displayed on one monitor, 4-port USB HDMI KVM switch built-in quad splitter, 4-channel video mixer. Maintain input aspect ratio if desired - no stretching necessary. 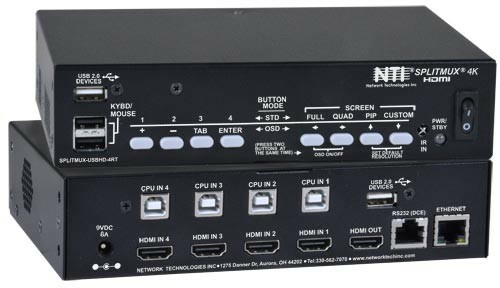 Control the multiviewer through Ethernet, RS232 serial port, keyboard commands, on screen display (OSD), front panel buttons, or IR remote. Supports HTTP REST API to configure SPLITMUX-USB4K-4RT with response in JSON format. Support for mouse commands coming soon.